Decius, who was born at Budalia, near Sirmium in Pannonia Inferior (now Martinci and Sremska Mitrovica in Serbia), was one of the first among a long succession of future Roman Emperors to originate from the Danube provinces, often simply called Illyricum. Unlike some of his immediate imperial predecessors such as Philip the Arab or Maximinus who did not have extensive administrative experience before assuming the throne, Decius was a distinguished senator who had served as consul in 232, had been governor of Moesia and Germania Inferior soon afterwards, served as governor of Hispania Tarraconensis between 235–238, and was urban prefect of Rome during the early reign of Emperor Philip the Arab (Marcus Iulius Phillippus). ↑ In Classical Latin, Decius' name would be inscribed as CAESAR GAIVS MESSIVS QVINTVS TRAIANVS DECIVS AVGVSTVS. 1 2 One or more of the preceding sentences incorporates text from a publication now in the public domain: Chisholm, Hugh, ed. (1911). 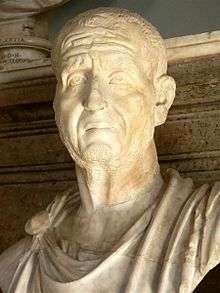 "Decius, Gaius Messius Quintus Trajanus". Encyclopædia Britannica. 7 (11th ed.). Cambridge University Press. p. 913.